The National Labor Relations Board has charged St. Joseph’s Health System (SJHS) with multiple violations of federal law in its resistance to SEIU-UHW’s efforts to organize over 9000 workers at the California-based hospital chain. The NLRB charges come on the heels of increasing national attention to the struggle, which pits the Mothers of the Sisters of St. Joseph of Orange–once strong allies of the United Farmworkers of America–against workers seeking to unionize and UFW alumni supporting their side. To date, the Sisters have insisted that they do not oppose unionization but simply want to guarantee workers a secret ballot election. But in December 2007 the NLRB found that SJHS committed several violations of federal labor law at a union election in one of its facilities, and the new charges appear to confirm SEIU’s claim that those managing the hospitals for the Sisters are engaged in persistent anti-union conduct. As the New York Times and other media begin focusing on the nation’s largest union organizing drive, the NLRB issued charges on July 31 that could undermine the employer’s (SJHS) claims that it is simply trying to respect workers rights. According to the NLRB charges, SJHS was involved in 35 separate incidents that gave rise to labor law violations, with 18 different supervisors involved. The NLRB charges come less than two weeks after SEIU-UHW held a major march and rally at the Mother House of the Sisters in Orange County that featured such key former UFW leaders as Dolores Huerta, Reverend Wayne “Chris” Hartmire, and Fred Ross, Jr. These leaders noted the contrast between the Sisters support of the farmworkers struggle in the 1970’s, and the aggressive anti-union tactics ongoing at SJHS. 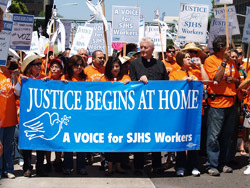 SJHS has long argued that it respects the rights of workers. But the recent NLRB charges appear to undermine these claims. Such charges includes claims that SJHS conducted surveillance of employees on their lunch breaks speaking with union representatives, coerced employees who approached the union, and interrogated employees wearing Union pulley pins. In a sign of the seriousness of the violations, the NLRB has asked as one of its remedies for an Order requiring SJHS to read the Notice to Employees about its violations to all employees on all shifts during work hours. According to labor experts consulted by Beyond Chron, such a remedy is only used where illegal anti-union conduct is particularly egregious. Spokesman for SJHS view the situation quite differently. They told Beyond Chron that SEIU has consistently filed unfair labor practice charges in order to create the impression of widespread wrongdoing, and that the vast majority of the charges have been dismissed. When asked about the NLRB’s July 31 Order, SJHS spokesperson Carol Aaron told Beyond Chron on August 11 that she had “no knowledge” of the charges. She reiterated SJHS’s position that the NLRB’s action was simply part of SEIU’s typical campaign strategy. In a further sign of rising pressure around the labor dispute, George Pérez, who headed Memorial hospital in Santa Rosa and led St. Joseph Health System-Sonoma County for the past three years, resigned his post this week. While no explanation for his departure was issued, Memorial has been the focal point of SEIU-UHW’s organizing drive in Northern California. Perez’s resignation culminates two weeks of intense union mobilization and increased regional and national media coverage of the dispute. According to Ross, the NLRB charges and related events “should serve as a wake up call to the Sisters that they need to get more involved and clean up their corporate house.” SEIU has made a major investment in this campaign, which is part of its overall strategy of increasing “union density” in the hospital field. Primarily non-union hospital chains like SJHS drive down wages and make it harder for fully unionized hospitals like Catholic Healthcare West to compete. Unionizing SJHS would level the playing field, raising the wages of workers throughout the hospital industry.